5 months 11 hours ago. The Charlottesville Symphony is performing Piping the Earth on their spring concert on April 27 and 28th, the former at 8:p.m. at Old Cabell Auditorium at UVA, and the latter at 3:30 p.m. at the Martin Luther King Performing Arts Center. So happy this will be heard here, especially conducted by Ben Rous, and hope to see some of my friends! I composed Piping the Earth for the Women's Philharmonic, conducted by JoAnn Falletta. Inspired by an image from the Chuang Tzu, I composed it during a residency at Bellagio, with storms sweeping in from Lake Como. the San Francisco Examiner called it a 'musical firestorm.' Love that image, though there are also quiet moments, like a chord that 'courses up and down like a crystal fountain..." (SF Chronicle). It's also available for download as well as streaming. 4 days 14 hours ago. Excited that Zipper Music (for 2 amplified zipper players and interactive electronics, with 2 MIDI controllers) will be premiered this week by the UVA New Music Ensemble on Thursday, 4/18 at 8:00 p.m. in Old Cabell Auditorium at UVA. With thanks to Max Tfirn for developing the Max patch as I developed the wild ideas for the piece, and to Alex Christie for additional excellent tweaks. And, to Alex and Travis Thatcher for performing the MIDI Controller parts. This is the latest installment in my Quotidian Music series. Had to create an entire new graphic notation for both the zippers and controllers. Here's the first page for the zippers! 1 week 16 hours ago. An absolutely joyous evening (4/6) with superb performances of my music by outstanding colleagues and guest artists (more soon), and a reunion of a number of our terrific past and present grad students in Old Cabell Hall at UVA! 2 weeks 8 hours ago. Composer Brian Simalchik is hosting A New Sound on WTJU (91.1 FM in Charlottesville) at 7:00 – 9:00 tonight. and you can stream later at https://www.wtju.net/recent-shows. Glyph, for solo viola string quartet and piano (composed for and dedicated to violist and dear friend Rosemary Glyde), will be on around 7:20 in the recording by the terrific violist James Dunham, the Cassatt Quartet and pianist Margaret Kampmeier, from my portrait CD Time to Burn. The entire show sounds enticing, with music by Meredith Monk, Du Yun, Lois Vierk, Christopher Cerrone and Anna Thorvaldsdottir. http://www.wtju.net 2 weeks 4 days ago. How fun that Steve Kemper and Juraj Kojs, two of my PhD students, both terrific composers who are now teaching at Rutgers University and the University of Miami respectively, are returning to UVA to give talks on my music as part of the Symposium this Friday! And also delighted that Denise von Glahn will be presenting - she does such fascinating work on music and nature, as well as gender issues in music. Looking forward! 2 weeks 5 days ago. Judith Shatin’s music, called “fresh and bold” (The Denver Post), combines beautifully crafted sounds and forms. 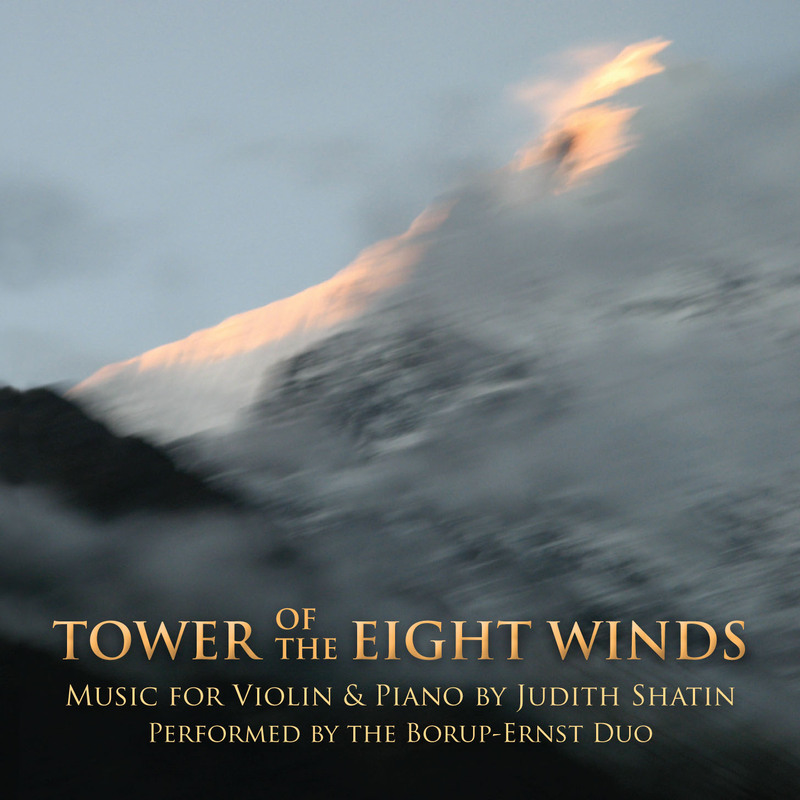 This disk, featuring her violin and piano music, is named for the eponymous Tower of the Eight Winds (2008, vln/pno), singled out for its “engaging vivacity” (The Washington Post). The CD features vibrant performances by the Borup-Ernst Duo. Praised by The Strad for their “watertight ensemble” and “interpretive warmth,” the duo traces the development of Shatin’s unique voice, beginning with Widdershins, (1981) for solo piano. Commissioned by Music-at-LaGesse Foundation, it displays the composer’s trademark rhythmic dynamism in a pianistic tour de force. "Richly textured" (The Washington Post), it plays with motivic ideas that reflect the “counterclockwise” meaning of the title. Her Icarus (1983, vln/pno), is a vivid tone poem, whose four movements reflect the dramatic arc of the story. Penelope’s Song (2003, 05), for amplified violin and electronics, shows the transformative power of Shatin’s timbral magic. Its entire electronic palette was created from the intricate rhythmic world of wooden looms. The disk's final piece, Fledermaus Fantasy (1995, vln/pno) is a virtuosic romp with witty chiaroscuro effects, built on four melodies from Johann Strauss’s delightful operetta. Performed by Hasse Borup, violin, and Mary Kathleen Ernst, piano. Judith Shatin is a painter of musical scenes; in fact, at times, she manages to rearrange our various brain functions to operate senses normally controlled by other lobes—for example, we truly see visual images associated with her notes. She doesn’t write programmatic music per se; it’s more subtle and complex than that, something magical that Hasse Borup and Mary Kathleen Ernst of the Borup-Ernst Duo are especially suited to demonstrate here in Tower of the Eight Winds … [Shatin] is able to produce ingenious and unusual music while, at the same time, retaining a certain accessibility and common musical lingo with universal emotional appeal. "[In Penelope's Song,] Shatin places the violin against an electronic part derived from recordings of a real weaver working at her looms. At the start, the electronic part is highly rhythmic and jaunty … accompanying a lively and purposeful violin part. In the middle section, the repetitive clatter of the looms is replaced by long-held, echoey timbres that set off rhapsodic writing for the violin. The idea of night following day is unmistakeable, and the transition back to day for the close of the work is very imaginatively done. Icarus … is a strong work. [T]he music is not a banal representation, but something altogether more complex and interesting. Tower of the Eight Winds … encapsulates Shatin’s ability to create well-defined, imaginative structures and to develop her ideas with clarity and vigor. Widdershins is a short sonata in three movements for piano solo. [T]he work offers a commodity often absent in recent music: energy. Both the first movement, titled “Energetic,” and the last, “Savage,” have a welcome dynamism and terseness. Even the middle movement, “Tranquil,” is no slouch. The players attack all five works with gusto and would appear to have completely mastered them. The performances are excellent and recording is exemplary. Recommended. "[Shatin's] music is well written, cohesive and substantive. It can frequently be intense, but it's always interesting and quite expressive. The five works on this album give a fabulous overview of Shatin's creativity. While all are scored for violin and piano, they are nevertheless wonderfully diverse and individual. Borup and Ernst give stunning performances that capture all the subtleties in each piece. Their interpretations are very perceptive and intuitive, and their playing is fluid and bring out the intricate interplay between the two instruments."